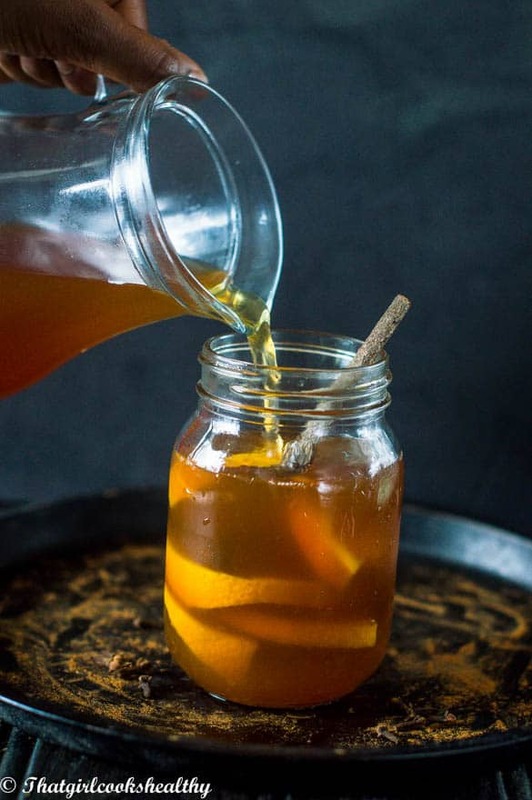 Cinnamon orange iced tea recipe – Kuwaiti inspired summer time iced tea refreshing drink made with black, cinnamon stick, and orange peel. Here in the UK, as it stands we are experiencing a mini heatwave which I am so happy about because the summer is my favourite time of year. Even though England isn’t known for it’s tropical weather, I will be candid enough to admit when the weather is hot over here, trust me it gets blazing hot. Lately, I’ve been thinking about an array of recipes that are befitting for warm weather. Yes, I know salads are the most obvious choice but my mind is on – desserts, drinks and popsicles. Just recently I was in my local supermarket buying some tea, now I love tea with a capital T – herbal tea that is, not English breakfast. I quite like green tea, black tea, red bush and peppermint tea – in no particular order. Anyway, as I was saying I picked up some black tea, as it was the first tea that I saw in the aisle for 89p which was a bargain might I add. When I got home as I brewed the tea, for some reason, iced tea was on my mind. I’d never tried iced tea yet heard all about it from my stateside friends. Before I continue writing, let me definite “iced tea”. Simply put iced tea is tea in the form of a cold beverage which can be flavoured and sweeten to taste. I don’t recall seeing iced tea in the supermarkets here in England, it’s definitely not widely available. For my recipe I flavoured my tea with some orange peel from an fresh orange and included a few spices – cloves and a stick of cinnamon. From there, while stirring, as the flavours infused I added the agave nectar, let it completely cool and packed a glass with ice ready to pour the tea over. The results were AH-MAZING, I can’t believe UK hasn’t embraced Iced tea, maybe I need to be the first to introduce cinnamon orange iced tea to this country. All I know is that this beverage will be taking me through the rest of the summer. In the United States, American people drink large quantities of iced tea – you can buy it from the supermarket in a can or have it freshly prepared. Iced tea is also popular in the middle east and Asia – especially Japan – oolong and matcha tea in it’s variants are the dominate tea.. The great thing about iced tea is that you can add various fruit – strawberry, lemon, lime, apple, orange etc… along with spices, mint and ginger. 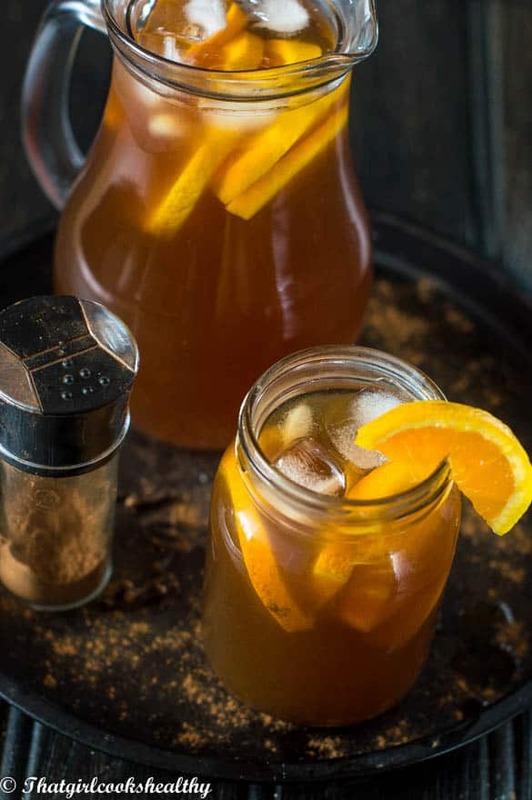 There is not written formula – I’m very partial to cinnamon orange iced tea because I like the warmth from the spices served in an extra ice cold beverage. Cheers, sip and most importantly…..enjoy! Boil the cold water in a large sauce pan. Once the water has boiled remove the pan from the stove, set aside and proceed to add the tea bags. Let the tea bags steep for 10 minutes, using a slotted spoon to discard after the given time. Add the orange peel and cloves and allow the flavour of both to infuse for at least 5 minutes. Pour and strain into a pitcher, throw away the peel and cloves. Stir in the agave nectar according to how sweet you would like your tea to be. Let the tea cool completely before storing in the refrigerator for several days. This sounds absolutely delicious. It is hard to believe iced tea isn’t drank, abundantly. all around the world. You need to get that going on in the UK. Thanks for the great recipe. I was in shock too Ginny, In the UK we drink tea but just not in the form cold/iced tea which is a shame because it’s so delicious especially during hot weather. This is the kind of drink I’d love to break out for big family meals. It sounds so good! 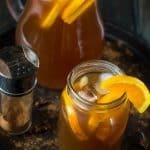 Great tea I didn’t thought adding cinnamon and orange together that is wonderful idea. I too make tea a lot, next time I will give this recipe a try. I promise you that you will enjoy it Swathi. 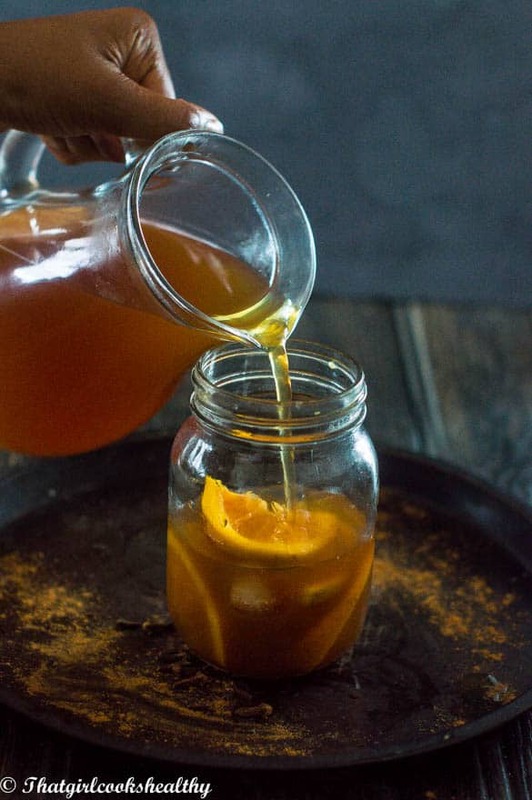 This tea looks so refreshing and with the kick of cinnamon. I could go for a glass of this right now! I bet this smells so good! And it sounds so refreshing!